- JOHANN-SEBASTIAN BACH AT THE ORGAN - A CD of JS BACH 's organ: Sonatas in trio. - JOHANN-SEBASTIAN BACH's FUGUE - A CD of organ: the art of JS BACH's fugue. - JOHANN-SEBASTIAN BACH's SACRED MUSIC : 2 CDs or albums of JS BACH's Sacred music. Passions. 2 CDs not to be missed.  CLASSICAL and JAZZ ARRANGEMENTS - JAZZ BACH - CDs of MJQ and PLAY BACH.  JAZZ AND SACRED MUSIC : Jean-Christian MICHEL, played transcriptions of JS BACH's, before composing his own music.  WHAT WOULD JOHANN-SEBASTIAN BACH HAVE LOVED? Johann Sébastian BACH was born at Eisenach in Thuringia, eastern Germany on March 21, 1685, into an extraordinary family of musicians. He was introduced to Music by the church organist but it was his brother Johann Christoph who first revealed to him the true secrets of the organ. He studied and passed with distinction the exams at Ohrdruf's boarding school. At the age of 15 Johann Sebastian was in Lüneburg where he worked as a singer at the Latin school for two years. He was able to find and study a great many rare musical manuscripts, and when he left Lüneburg he was already a brilliant organist. Johann Sebastian obtained, at 21, the prestigious post of organist to the town, in Mühlhausen's church. In the same year he married his cousin, Maria Barbara BACH with whom he had six children. The following year Johann Sebastian BACH moved to Weimar and became concert organist and director, a post he held for 9 years, it was during this period that he composed many of his religious cantatas and organ pieces. His mastery of the organ and the fugue, since then unequalled in Europe, quickly made him famous and brought numerous invitations. However Johann Sebastian BACH was a musical genius, not a courtier, and had little talent for political intrigue. It was because of this that the post of choirmaster was refused: Offended, he left Weimar. At 44 Johann Sebastian BACH also took over the management of the Collegium Musicum. He composed the Cantatas and the great Oratorios. Johann Sebastian BACH's working week was not limited to 35 hours! At 51, in addition to his post of Cantor to Leipzig he was named as "Choirmaster" of Dresden and as composer to Frédéric Auguste, Elector of Saxony. The city of Dresden possessesd an intense cultural and musical life. This is the period when Johann Sebastian BACH composed the Goldberg Variations, the canonical Variations, Well-Tempered Clavier vol 2, the Art of Fugue and Mass in B minor. Serious health problems affected the composer. Cataracts made him almost blind. He died of a heart attack at the age of 65 in 1750. Johann Sebastian BACH was the unequalled master of baroque music, the god of the fugue and of the counterpoint and certainly one of the greatest geniuses in the history of Classical music. His multi-dimensional and unlimited vision timelessly engraves him on the universality of all music.
. all of a sublime beauty and so perfectly written that one cannot listen to these marvels without being delighted and admiring. 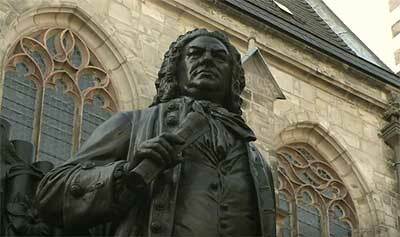 Virtuoso organist, exceptional improviser, in forty years Johann Sebastian BACH wrote innumerable pieces for the organ. 27 Preludes, Toccatas or Fantasies and Fugues, Concertos, Trios, Sonatas, Orgelbüchlein Chorals. It is on paper and on the organ, his preferred instrument that he composed most of his works. - THE ART OF THE FUGUE by JOHANN-SEBASTIAN BACH. Church pipe organ "on show"
The Fugue is a musical piece written according to very strict compositional rules. Based on imitation, it starts with a main musical theme initially played alone, then repeated with variations as a response, by different instruments. The theme is often accompanied in counterpoint by a secondary theme called the counter-theme. When the theme and the responses have been fully developed in the dominant and in all the nearby tones and by all the voices, the strette or final part reprises with increasing rapidity the main themes of the piece. Johann Sebastian BACH, is the Grand Master of the fugue and the counterpoint. Endowed with an extraordinary inspiration, he exploits all the resources of polyphony and, at the end of the life, half blind, he was forced to dictate his " Art of the Fugue" being unable to finish it himself. A CD OF GRANDIOSE JS BACH : JS BACH, Art of the Fugue BWV 1080 by Marie-Claire ALAIN. Johann Sebastian BACH's work is that of a genius and a profoundly religious man. He succeeds in transcribing his profound spiritual strength in sublime enchanting music, as complex as it is harmonious. Johann Sebastian BACH's chorals, his religious Cantatas, his Masses - particularly the Mass in B minor - the Magnificat, the Oratorios and the Passions - immense oratorios for choir and orchestra - make up his Sacred music. 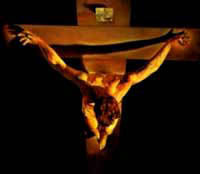 The Passion according to St Matthew, and the Passion according to St John, are among the richest of all music. The Choral remains one of the pillars of the church music : a religious hymn, drawn from the secular and the Sacred traditions, Johann-Sebastian BACH is famous for developing this genre to it's highest level. TWO CDs OF JS BACH are absolutely unmissable : JS BACH: Matthäus-Passion by Herbert von KARAJAN and JS BACH : Johannes Passion by György Lehel.  JOHANN-SEBASTIAN BACH'S CONTRIBUTION TO MODERN MUSIC. Johann Sebastian BACH's work established the foundation of all modern western music. MOZART would be able to write his sonatas, his masses and operas, on the very solid foundations constructed by Johann Sebastian BACH! One could say that all the musicians who succeeded Johann Sebastian BACH benefited from the contribution. Numerous composers were inspired directly by the Cantor of Leipzig, such as Gounod in his Ave Maria, or RAVEL vigorously separating himself from the revitalised impressionism through a writing style of " BACH back to front "
Improvisation was commonplace in Music before the advent of the romantic movement in music. Well before BACH - practically since the time of the monody with continuous bass - the least musician knew how to improvise within a piece. Athough improvisation diminished in Classical music, it reappeared in force in Jazz . Swing - a beat drawn from syncopated rhythms - and expressiveness - phrasing, sound's work and feeling ( a sensitivity particular to Jazz musicians ) - these are the main characteristics of Jazz. Born in the cotton fields of New Orleans, inspired in its origins by Lutheran chorals singing, made poignant by its " blue note ", Jazz gradually became increasingly sophisticated , then intellectualized to finally develop into version one could call "European", more elaborate and combining classicism and modernity. Louis ARMSTRONG is a Jazz genius comparable to JS BACH in Classical music. Three big Jazz names on the clarinet: Jan GARBAREK, Sidney BECHET and Mezz MEZZROW. UNMISSABLE JAZZ CD : Louis ARMSTRONG, Series Hot five and Hot seven. From PENDERECKI to BOULEZ until today, music has not stopped evolving. Composers like BARTOK, ANSERMET, STRAVINSKI, or GERSHWIN were inspired by or wrote for Jazz. At the same time, a new generation of contemporary Jazz interpreters grew up with a new vision of music. Samson François and Glenn GOULD opened the road. Chick COREA adopts a thorough approach by deviating from conformist interpretations, with an unmatched musicality in his "MOZART sessions".. RECOMMENDED CDs OF CLASSICAL MUSIC : Glenn GOULD plays BACH - Italian Concerto etc... - Chick COREA and Bobby Mc FERRIN : The MOZART SESSIONS. Numerous musicians have imagined an even more direct link between Jazz and Classical Music. Arrangers have transcribed J-S BACH in Jazz, composers have integrated him into their work, creating a new musical style: Gerry MULLIGAN, George SHEARING Bill EVANS, John LEWIS's MODERN JAZZ QUARTET, Milt JACKSON and Kenny CLARKE in the CD " Blues on BACH ", SWINGLE SINGERS, Jacques LOUSSIER with his CDs " PLAYS BACH ", CLASSICAL JAZZ QUARTET of Daniel HUMAIR and Guy PEDERSEN and finally Jean-Christian MICHEL, to quote but a few, have benefited from a classical culture and refer to ( and honour ) Johann Sebastian BACH. JAZZ TRANSCRIPTIONS FROM JOHANN SEBASTIAN BACH'S MUSIC. Johann Sebastian BACH's music lends itself very well to Jazz transcription. Its rhythmic ease allows the accentuation of weaker beats without betrayal, and by bringing together the structure with swing ( double time crochets ) or syncopated rhythms actually more modern and more elegant than their precedents, ( accentuated crochets ), one is able to create beats and the basic swing of Black American music. An excellent example is supplied with the " Trio in minor C " transcribed by Jean-Christian MICHEL. RECOMMENDED "JAZZ and CLASSICAL" CDs : Blues on BACH, Django by MODERN JAZZ QUARTET and PLAY BACH, Italian Concertos by Jacques LOUSSIER. When listening to Jean-Christian MICHEL for the first time, one is amazed to discover a completely new sound of clarinet, organ, synthesizers and percussion. We discover a unique form of composition and improvisation. Jean-Christian MICHEL has invented a unique musical style based on Jazz and Sacred music. The vitality and expressiveness of Jazz extends the depths and mystic dimensions of Sacred music. His sensorial clarinet playing and a "feeling" totally his own allow one to recognize him amongst a thousand others.... With the contribution of Jazz, Classical music gains a new dimension and the inverse in also true. JEAN-CHRISTAN MICHEL TRANSCRIBES JOHANN-SEBASTIAN BACH THEN COMPOSES HIS OWN MUSIC. Jean-Christian MICHEL composes his own themes. Many of them are imprinted with the spirit of the Cantor of Leipzig. His "Fugue Etincelante" ( Sparkling Fugue ) is a model of the genre: it is an authentic fugue with theme, counter-themes, displays of nearby tones, entertainments and finale ! A little marvel in the baroque style which would not have shamed Johann Sebastian BACH. Jean-Christian MICHEL, in certain pieces, succeeds in breaking musical limitations imposed by the score : For example in the Choral BWV 727: "Herzlich tut mich verlangen" the bass pedal part, transposed up 3 octaves is played on the synthesizer as a flute with portamento effect. This voice illuminates the piece like a ray of light from above and offers a new vision of the work. Johann Sebastian BACH's writing is not betrayed - there is little to displease the purists or the narrow-minded, only a clarinet interpretation magnificently free of constraint suggests Jazz . Jean-Christian MICHEL has not only studied BACH, but also DEBUSSY, RAVEL, SATIE, VIERNE and Jehan ALAIN. A truly complete musician he played Jazz throughout his adolescence. Although his art is marked by the enriching influence of the Cantor, he quickly found his own creative path, composing remarkable works such as the Concerto of Port Maria and Ezéchiel's Vision. Often accompanied by Kenny CLARKE, percussionist from the MODERN JAZZ QUARTET, Daniel HUMAIR and Guy PEDERSEN, Jean-Christian MICHEL proves that solid technique, a knowledge of the fugue and counterpoint, are not unimportant, if one really wants to win a place at the pantheon of the great musicians. WOULD JOHANN SEBASTIAN BACH HAVE LIKED IT ? PLEASE, READ WHAT THE PRESS THINKS - (Numerous extremely positive reviews, notably during the diverse " BACH TAGE " in Germany - cradle of Johann Sebastian BACH's music).  Three unmissable CDs by Jean-Christian MICHEL : Port Maria, Musique de lumière ( Music of Light ) and "@ranjuez" ( new arrangement of Aranjuez's Concerto ), "JS BACH TRANSCRIPTIONS..